​Dr Wee Chee Keong, Consultant at the Department of Neurology at the National Neuroscience Institute, is here to answer your questions about stroke. ​Consultant at the Department of Neurology at National Neuroscience Institute, about stroke. Stroke accounts for more than 10 percent of deaths in Singapore and is the leading cause of adult disability here. Do high blood pressure, diabetes and high cholesterol automatically increase your risk of developing stroke? Can you reverse your lifestyle habits to prevent stroke? If your loved one has a stroke, does it mean you’re at risk too? 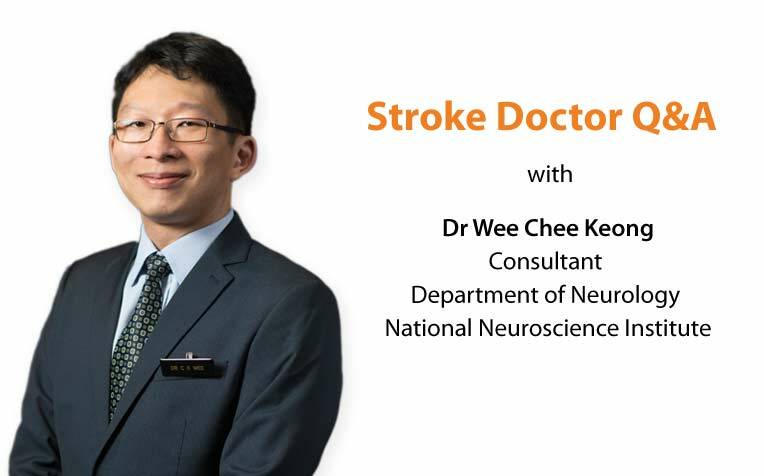 Take the chance to ask Dr Wee Chee Keong, Consultant at the Department of Neurology at the National Neuroscience Institute, a member of the SingHealth group about stroke. This Ask The Specialist forum has closed. Dr Wee Chee Keong Consultant Department of Neurology (SGH Campus) National Neuroscience Institute. Dr Wee Chee Keong is a consultant at the Department of Neurology at the National Neuroscience Institute. He has a keen interest in the ischaemic strokes and reperfusion therapies. He recently returned from a year-long fellowship with Professor Graeme J. Hankey at Sir Charles Gairdner Hospital in Perth with a focus on hyperacute stroke treatment. Back in Singapore, he contributes actively to the acute stroke team, members of whom are rostered every day of the year to help provide treatment to stroke patients arriving at the hospital. See next page for answered questions on stroke by Dr Wee Chee Keong.